If Fiat has its rock star with the 500, Chrysler can count on the Wrangler as the iconic car that never gets old. This famous SUV has become the symbol of Jeep thanks to its unique design and its good positioning. The Wrangler isn’t a cheap car; it isn’t comfortable at all; and it isn’t the most beautiful either. 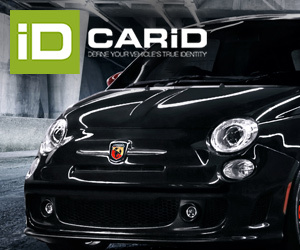 But it has charm, it is original, and has a strong personality, just as it happens to the Fiat 500. These characteristics and the good positioning of the car, allowed Jeep to sell a record of more than 194.000 units in 2012, becoming one of the top 10 best-selling cars of Fiat-Chrysler group. It is mostly popular in USA, where its sales counted for 73% of total, but this SUV is highly appreciated in most of the markets it is available. It could be even more popular if it wasn’t because of the high prices it is offered in non-NAFTA markets, because the Wrangler is only built-in USA and exported everywhere paying a lot of import taxes. The good thing is that the model has a strong awareness and a very positive image among consumers. Based on that, Jeep should exploit more the popularity of the Wrangler by enlarging its success in other SUV segments. The Wrangler is a symbol among SUV in the whole world. The Wrangler’s success formula should be the base for the development of the new B-SUV to be built along with Fiat in Italy. It means that the first mini SUV of the brand should focus on the values of Wrangler but in a smaller package, so people in love with it can have a cheaper and lighter version. At the same time the Fiat 500X (to share components and platform with the mini Jeep) will be the option for those looking for a stylish city SUV. Average price of the Wrangler is 30.000 euros for the 3 door version and 40.000 for the Unlimited (5 doors), so a big part of the population can’t access to this particular car. 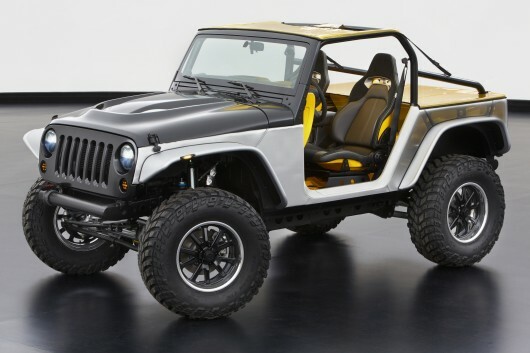 If Jeep takes the design shapes and personality of the Wrangler, and adapts them to a lighter and cheaper version, more people could finally enjoy of this particular SUV, and the brand could gain new clients. As the Wrangler belongs to D-SUV segment, there wouldn’t be any type of cannibalism between them. It is more or less what Fiat did with the 500 and the 500L: the same values in different packages. This time would be in the opposite way: from big to small but keeping what people love of the Wrangler. In this way the small Jeep wouldn’t be a problem for its cousin, the Fiat 500X, as they would be positioned in different ways, just as happens to the Wrangler and the Cherokee. They belong to D-SUV segments but they are completely different SUVs. If this formula works, Jeep could think of adding the same values for an eventual C-SUV that would be offered along with the regular Compass and a the new SUV from Alfa Romeo. Finally, the offer in the entry-level SUV segment could be perfectly completed with a 3 door mini SUV based on the Panda. 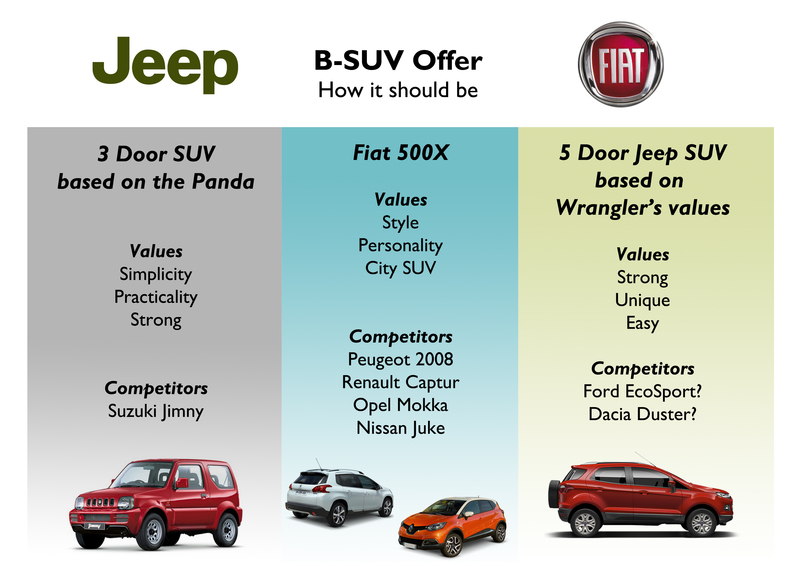 As I wrote in a previous article, Fiat brand should enlarge the success of the Panda just as it is doing with the 500. The Panda 4×4 is one of the few 4WD options in the segment, and people like it, despite its high price. The B-SUV segment is becoming more and more important in Europe, but there isn’t a 3 door SUV yet. The only offer is the Suzuki Jimny, which had interesting results in some European markets. But Fiat can exploit the values of the Panda and take them to a 3 door functional SUV for those looking for a simple and practical SUV, and not the stylish and sophisticated Renault Captur, Peugeot 2008 or Nissan Juke. In this way Fiat-Chrysler would have a complete range of products in one of the fastest growing segments in Europe: a 3 door practical and simple Panda SUV, a stylish 500X, and a rustic and strong small Wrangler. Here we are Juan!!! I love when you write this kind of articles! Thank you very much Ardit! The Wrangler has the same cache as LR defender and the name could easily stretch into several categories, but probably this size is one too small. Better to have a C SUV size as smallest.